Aluma Wallet – As seen on TV and by RFID skimmers ? 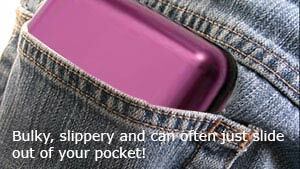 There are many RFID wallets on the market and none are as aggressive in their advertising as the Aluma Wallet. We applaud Aluma Wallet for helping educate the public on the issue of needing RFID protection, as most people either didn’t even know there was an issue or just never thought it would happen to them. well done for getting it out there. 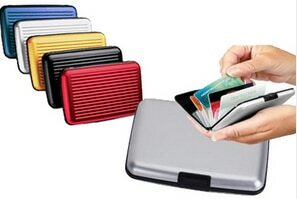 Aluma Wallet quite rightly states several very real statistics on their infomercials and they believe that a hard aluminium cased wallet offers some level of protection against electronic pickpocketing. 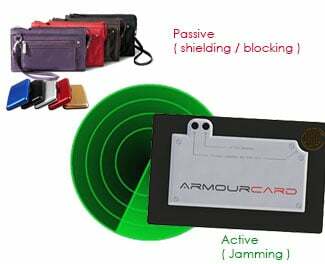 We at ARMOURCARD have done our own research and we were not satisfied that the level of protection these aluminium wallets like Aluma Wallet give actually prevents a dialled up power RFID reader from penetrating their metal cases. Plus the fact that with ARMOURCARD you can own any wallet you like and not be forced to buy any ugly RFID protection claiming wallet to get at least what is perceived to be some ‘passive’ protection. No we developed ARMOURCARD and patented our new ‘Active RFID Protection’ that actually jams the RFID & NFC signals so no queries from a reader regardless how powerful the reader is dialled up or how big the antenna is, will no circumvent ARMOURCARD’s jammng technology. NOT from passively, maybe, hopefully trying to block a signal?.. BUT actively jams all RFID & NFC signals using the most common bandwidth used for contact-less devices of 13.56Mhz. Now you can protect yours.